Rural health care practices share certain commonalities, but “no one approach fits all” when it comes to providing medical services in their communities, said Katie Trotter, a health-care consultant and project leader for the Michigan Health Improvement Alliance (MiHIA), a multi-stakeholder collaboration that covers 14 counties centrally located in Michigan’s Lower Peninsula. Higher poverty rates, lower literacy levels, limited transportation and lack of multiple services in one location are a few of the issues that can affect the health and health care of rural residents. Trotter sees solutions, though, in helping rural providers integrate Choosing Wisely recommendations, practices and patient materials into their daily office routines. In a four-month pilot project, “Reaching Rural Providers, Patients and Communities,” Trotter helped MiHIA partner with four rural health sites – a three-doctor independent family practice, a primary-care clinic at MidMichigan Health, part of the University of Michigan Health System, and two clinics in the St. Mary’s of Michigan regional health system. Each practice developed a site-specific plan that fit into their office environment, with a wide array of Choosing Wisely handouts and supporting materials to select and use. They also had the option of scheduling Trotter to counsel office staff on how to approach conversations about care delivery with a Choosing Wisely focus. “The goal was that patients would be connected [with Choosing Wisely messages] more than one time when they came of an office visit,” said Trotter, who provided monthly support packets with links to Choosing Wisely resources. The project was funded by the Saginaw Community Foundation. In addition, she distributed 800 “5 Questions to Ask Your Doctor” wallet cards and 240 brochures on specific topics such as antibiotic use to the sites, and provided each with a binder of “how-to” information on empowering patients and office staff to discuss Choosing Wisely recommendations. Some sites screened Choosing Wisely videos on television monitor in their waiting rooms, and others integrated Choosing Wisely touchpoints into the workflow by distributing wallet cards when patients checked in with receptionists and topic brochures when nursing staff settled patients into exam rooms. The project ran from January-April 2018. In a patient survey given at the project’s conclusion, 93 percent of respondents agreed or strongly agreed that they wanted their physician to discuss why they recommended a test or procedure. A quarter of respondents agreed or strongly agreed that they had suffered financial or physical harm from a medical test or procedure, and 71 percent said it was important that the cost of a test or treatment be considered when discussing medical care. Trotter said one result of sharing Choosing Wisely materials with patients was that care teams became more knowledgeable as well, understanding the importance of spending a bit more time with patients, and often used the brochures when speaking with callers asking for antibiotic prescriptions and other potentially unnecessary services. Peggy Glynn, a practice consultant who advised the St. Mary’s medical offices on how to present Choosing Wisely materials, said the biggest challenge was having time to talk with patients. Each office serves 2,500 to 3,000 patients each year in the farming communities. “They are very busy doing the 101 things they need to do when they are rooming a patient,” said Glynn. But she added the project was beneficial for the staff, as well, who might not be aware of the evidence-based recommendations. 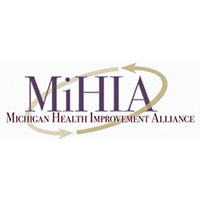 MiHIA is focused on the Great Lakes region becoming the healthiest thriving community with the best quality and value in health care, and seeks long-term sustainability in the design of initiatives targeting four facets of health outcomes: improved population health, improved patient experience, lower costs, and improved work life of health care providers.